and are thrilled to be alive! Offered in 5 tracts, buy one or all! Abundant frontage on both sides of Middlefork Rd. Currently being surveyed by PS PS Surveying. The Anderson’s moved here in the early 1960’s and it is now time for someone else to have dreams come true. 140 Acres fronting on both sides of Middlefork Rd., and +/- 3 miles off SR 180, being offered in 5 tracts. What more could you ask for? This farm has been primarily utilized for hunting, fishing and grazing livestock! Some fencing, and a fenced garden for livestock, and to keep the deer out of the garden! Buy one or all, if you have been looking for a property +/- 45 miles to Columbus, 6 miles to Laurelville, 20 miles to Circleville or 20 miles to Logan this could be the one. 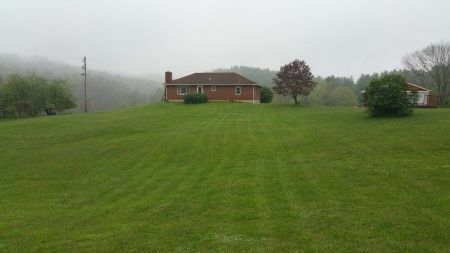 Tract One: 6 Acres, 3 bedroom brick home w/full basement, garage & pole barn. Tract Three: 42 Acres adjoins Tract 2, stream, woods, open fields, abundant road frontage & meadows. Tract Four: 67 Acres of mostly wooded land w/some pasture. 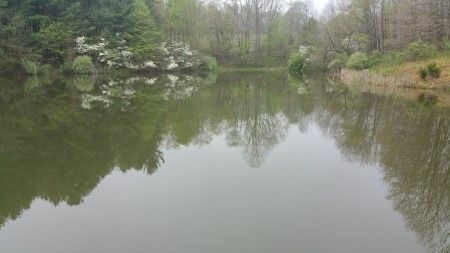 Tract Five: 9 Acres of woods, a pasture hilltop with pond and valley views. Tractors: Ford 5000, showing 1,475 hours, pto, 2 hyd. Aux., draw bar, 3 pt. ; Ford 901 Power Master, 3 pt., pto, hyd. Aux, draw bar. Trailers: Hudson Bros. pintle hitch tandem axel equipment trailer, ramps, wood deck, model HSM14, 8,000 lb, apx. 14 ft.; Bumper pull Stock trailer apx. 14 ft. W-W Trailer Manf. 5,000 GVWR. Implements: BUSH HOG 3 pt. pto driven rotary mower RD5 model apx. 5 ft.; KING KUTTER II pto driven 3 pt. tiller; PONY Rototiller with briggs & Stratton 5 HP motor; 3 pt. potato plow; sickle bar mower; 5 bar hay rake; 6 ft. pull behind disc; 8 ft. 3 pt. field cultivator; yard roller; Ferguson 2 bottom plow; 3 bottom plow. Real Estate Terms: $6,000 down at time of sale cash/check per tract with positive photo ID; Balance & Possession upon delivery deed at closing on/before September 6th 2016; Offered free & clear prior to closing; Sold in As-Is condition; No buyer’s contingencies exist; Buyers will agree to pay an additional $1,000 per tract above & beyond the contract price towards the new survey costs; Real Estate Taxes will be paid current for the year 2015 & will not be pro-rated to day of closing. Personal Property Terms: Paid in full at time of sale cash/check with positive photo ID; Removal day of sale; Sold As-Is; no warranties given, expressed or implied.